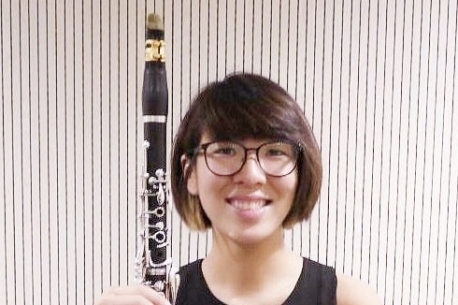 Wong Yuen Hung holds a Degree of Music from Hong Kong Baptist University, majoring in clarinet under the guidance of Martin Choy and Johnny Fong. Wong is currently studying clarinet under Lorenzo Iosco. Wong trained on clarinet since the age of 13, attained ABRSM Grade 8 clarinet at age 16 and ATCL recital in clarinet in 2013. As an active clarinetist, Wong attended the clarinet masterclasses in the Kitakaruizawa Seminar and studied under prominent clarinetists, Ayako Oshima and Charles Neidich. Wong also played in Hong Kong Philharmonic Orchestra Masterclasses with Lorenzo Iosco and the Asian Youth Orchestra Masterclasses with Paolo Beltramini. Wong is also a keen chamber musician. She cooperated with different new generate composers and performed their compositions. Wong has also won the second runner-up in clarinet ensemble class in Hong Kong Clarinet Festival 2016. Over the years, Wong actively participated in different ensemble, such as Hong Kong Baptist University Wind Symphony, Parsons Wind Orchestra, Hong Kong Symphony Band and Hong Kong Festival Youth Wind Orchestra.